Inside Old Roberts Schoolhouse we will review what an orienteering map looks like, how the natural and artificial features of the terrain are depicted on the map, and how to orient the map as you navigate from one position to the next. Next you'll head to the beautiful McKaig trails and have an opportunity to practice your new skills on a novice course in the woods. All the control points will be on the trails of the McKaig park. We'll use an electronic timing system so you can see how quickly you navigated to each position. 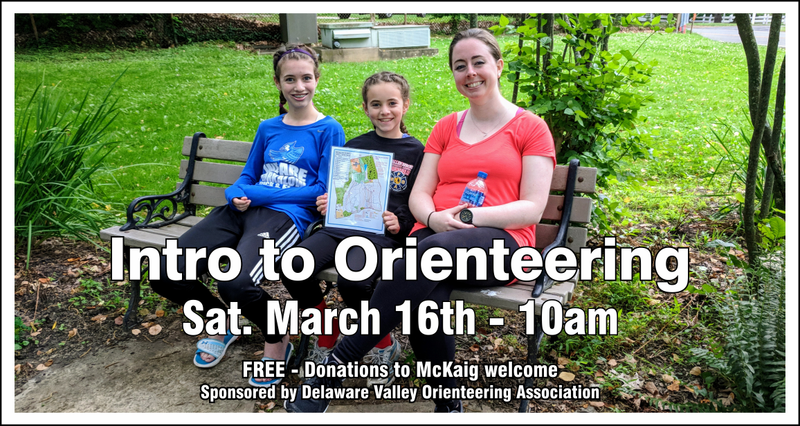 Upon completion of the course, we'll review the schedule of events the the Delaware Valley Orienteering Association has planned for the spring and summer, including the events held at McKaig, and what to expect at an event. You'll learn where to find permanent courses you can do anytime and what other related (and sometimes longer) events are available in adjoining regions. Due to the high demand for this class, we've been asked for additional donation options, choose from the McKaig's "Turning Discovery into Legacy" student education fund, the Old Roberts School Preservation fund or the $25 Sponsor a Tree program. We rely fully on memberships and donations and receive NO TAX proceeds. We rely fully on memberships and donations and receive NO TAX proceeds. Thank you.